Winter can be long and uncomfortable if you don’t have a fan. I know the first thing that comes to your mind when you hear of a fan is cool air; of course, that is the universal understanding and probably the primary goal of fan construction. But times have changed, fans can offer warmth. Well, not every fan has this capability and this is why you should consider Harbor Breeze Mazon. If you are looking for cool, warmth, and style in your house or office then look no further. The ceiling fan is a combination of all these factors. Apart from basic features of speed and intensity control, Mazon offers incredible experience with its enhanced features. 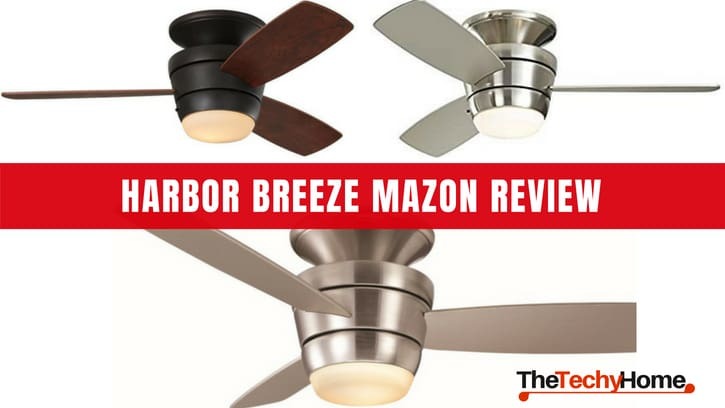 Harbor Breeze Mazon is a 44-inch indoor fan with exemplary performance. It is among the popular ceiling fans in the market because of ease of installation and enhanced features to suit individual preferences. Whether you want to reduce humidity or warm up your bedroom, the ceiling fan has got your needs. Flush mounting distinguishes it from other ceiling fans; it doesn’t require a down rod to hence occupying less of your space. It is best for living rooms and bedrooms because of its 100 square feet limitation. The airflow is also estimated at 4545 CFM, which is enough for your home airflow needs. Harbor Breeze Mazon is integrated with quiet motor technology, which enhances its power and performance level. The ceiling fan has a range of speed levels to suit different airflow needs for different people. Some people find fan rotation disturbing and can lead to nausea or dizziness, to some, the fan is not effective if the air obstruction cannot be felt. Harbor Breeze Mazon is silent in its rotation; you won’t notice the effect unless you were in the house before. No sound or noticeable change of airflow direction; the blades are programmed for uniform air circulation. The remote control and light controls ae available according to your preference; use them to your liking. The blades rotate in clockwise direction, which is a standard function; won’t confuse your mind or interfere with your concentration while studying. 3 speed level is more than enough for your home needs. The power and intensity of airflow courtesy of enhanced AC is incredible. You will rarely use the top speed because of the high intensity; while it is recommended for indoor use only, Harbor Breeze Mazon performs beyond expectations. It can actually work outdoors, be wise when making this decision. It depends with the area and number of people you intend to serve with the fan. Speeds can easily be switched even when the fan is running; either on the wall or remotely. Flexibility in switching and adjusting intensity of airflow makes it suitable for home use. The speed levels ensure you are comfortable in your bed at 2 am as well as comfortable at 2 pm when you need different airflow intensity. Do not underestimate the maximum airflow of 4,545-CFM. Actually, you will underutilize this ceiling fan in your home. Harbor Breeze Mazon has a reversible capability for cool and warm airflow. Whether it is winter or summer, the ceiling fan is your loyal partner in making your home comfortable. Once you install the Mazon appliance, you should not worry about seasons; all you need is familiarize with its numerous settings on the wall as well as on the remote. Airflow is limited to 100 square feet basing on blade diameters and speed levels. Harbor Breeze is not enough in your home without some style. The light kit is covered in a decorated glass to create illusions and beautify your living room or bedroom. 18-watt LED light bulbs are installed, which provide enough light in your bedroom. You have an option of switching the lights on and off with a remote control; you don’t have to light up your living room with colors during the day unless it is a birthday. Of course, you don’t want to wake up in the middle of the night to switch off/on a ceiling fan; the remote control is for your convenience and flexibility. It is integrated with all settings you need; speed and light controls. Nothing should interfere with your sleep. Also, the remote control reduces distraction element of a fan; you don’t have to interfere with a story with your peers on a weekend or pause a movie to switch a fan on/off. 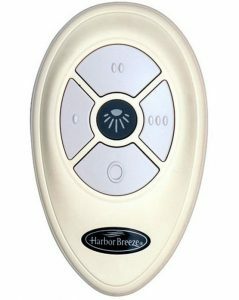 Harbor Breeze Mazon can easily be installed with its flush mount capability. It doesn’t protrude much out of your ceiling thus leaving enough space for other interior décor. 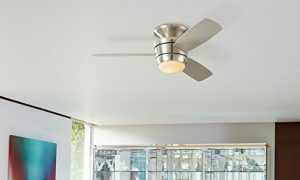 The Harbor Breeze fan is installed with help of canopy attachment, which enhances its appearance in your living room. 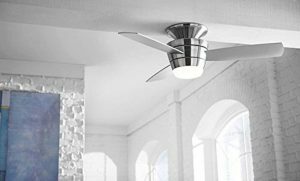 Whenever you check on mounting options of ceiling fans, Harbor Breeze Mazon will come up in your list as a unique and easy appliance for home use. Install this ceiling fan in your living room and bed room for best performance; whether you need cold or warm air, the control is literally in your hand. The manufacturer is kind enough to repair your ceiling fan free whenever you have an issue; the warranty is lifetime! Still, be sure to follow instructions and use it as required.